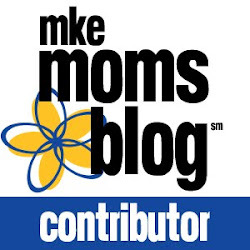 So, when I saw that Jurassic Quest would be in Milwaukee (for the very first time! ), I knew we had to get there. Last weekend, Matt, Callum, and I did just that. You guys. I am not even kidding you when I say I felt like I was in the movie Jurassic Park. It was so unbelievable! It definitely put our one T-Rex at the Milwaukee Public Museum to shame. Jurassic Quest dubs itself the largest exhibition of life-size, moving, museum-quality dinosaurs in North America. 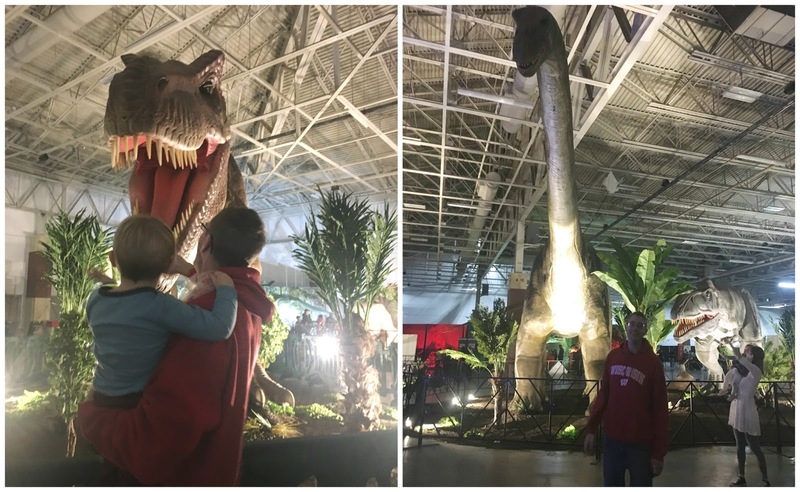 The exhibit features more than 50 animatronic dinosaurs that you can interact with. You can even ride a few of them. It was just so cool. The dinosaurs were moving, roaring, and even swinging their tails back and worth. Plus, they were most definitely life-size. Many of them made my six-foot-plus husband look like a little ant. When we first walked in, Callum was waaaaaay overwhelmed. Like way overwhelmed. We quickly found some baby dinosaurs that he could ride and get close to. That helped a little bit, but he was still a little nervous of the huge roaring, moving dinos, and I totally can't blame him. So, we made our way to the back of the expo hall where they had a bunch of activities geared just towards little ones. I look forward to going back when he's a little older and we can really get in to the different types of dinosaurs and learn so much more about all of them. We spent most of our time there with the friendlier dinosaurs. 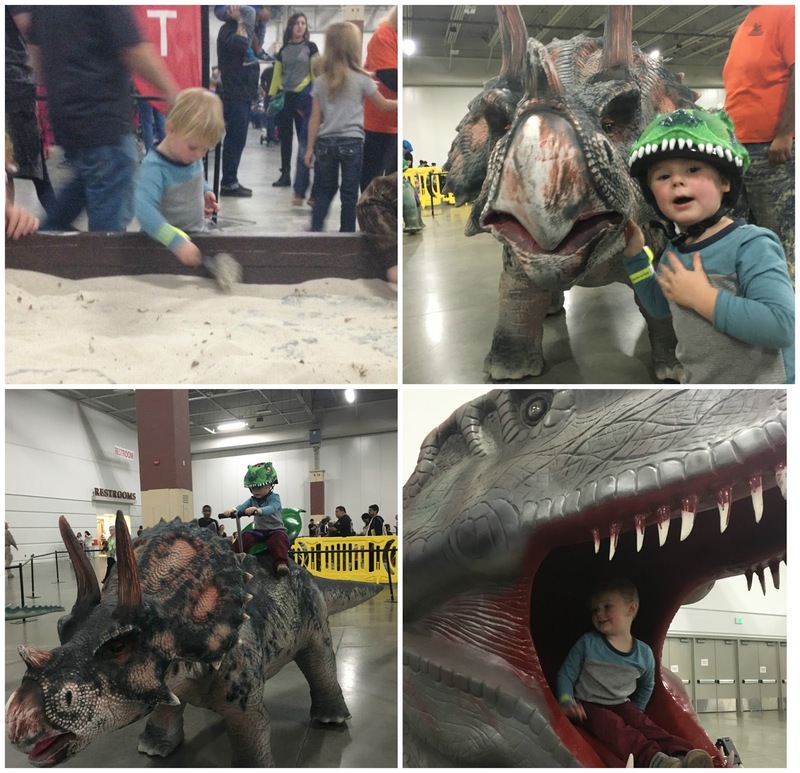 There were dinosaur-themed bounce houses and slides, an area to do some excavating, little jeeps for the little ones to drive, and even the opportunity to ride a real-life moving dinosaur. We easily killed a couple hours here and totally wore Callum out. (Thank God for bounce houses! Amiright?) P.S. Watch a video of Callum riding a triceratops here. How cool would it be to have one at home and just ride it around the neighborhood? I will say that the line for some of the activities was looooooong. I would stand in line while Matt and Callum would go do something else for a bit. The line was especially long to ride the dinosaurs. I think I waited for 45 minutes, and the place didn't seem especially crowded. So, I would definitely recommend getting there right when everything opens and getting in those lines right away. This post would not be complete without a huuuuuge shout out to all the staff at Jurassic Quest! These awesome people lifted kids on top of dinosaurs and strapped them in, were literally run over by the jeeps with the tiny (very inexperienced) drivers, and were so patient with all the kiddos. Everyone had a smile on their face and respected the fact that this was a new, exciting experience for every one of the kids, even though the staff was spending their ENTIRE day doing it. I really don't know how they did it. I was beyond impressed. They also have two shows that run regularly throughout the day: one featuring baby dinosaurs and one featuring walking dinosaurs. We were able to catch the end of the baby dinosaur show, and it was so worth it. 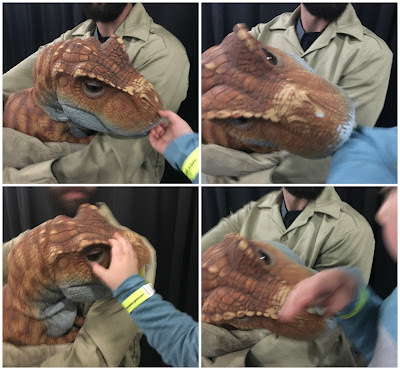 They talked about all about the different types of baby dinosaurs they had, and then they walked around with tiny animatronic dinosaurs that you could pet. It was so crazy! The baby dinosaurs seemed so real! They would nuzzle you or nip at your clothing. They weren't puppets because the people carrying them had both of their arms wrapped around them. I was pretty convinced that they were actual baby dinosaurs. It was pretty exciting, even for me, to suspend reality for a bit and imagine they were real. We spent about three hours exploring Jurassic Quest before nap time called and we had to get our tired toddler home. But, I totally wish we would've had more time. If Jurassic Quest is back next year, we will definitely be there! With Callum another year older, I'm sure he'd be a little less afraid of the larger dinosaurs and even more in to everything. Long story short: Jurassic Quest is an awesome experience for kids and adults of all ages. There was more than enough to do to keep everyone busy for a long afternoon or even the entire day. Even if your kid is not super in to dinosaurs, they'll have a great time at Jurassic Quest.